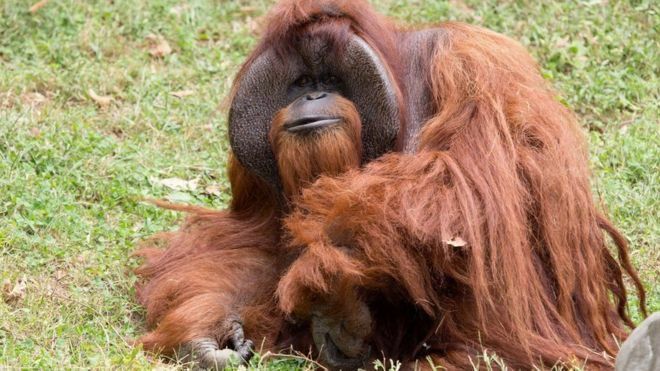 An international group of biologists and psychologists have found that orangutans find solutions to complex problems more quickly than even eight-year-olds. An international group of biologists and psychologists have found that orangutans find solutions to complex problems more quickly than even eight-year-olds. Moreover, they do not require a hint, as often happens with children, reports BBC. “We gave the orangutans a vertical tube in which a reward basket with a handle and a straight piece of wire were placed. The second task was similar – a horizontal tube and a wire bent at an angle of 90 degrees were given to primates,” says cognitive biologist Isabel Laumer. which led a group of researchers. In the first case, primates were required to bend a hook from a wire in order to get the bait from a vertical pipe. In the second type of tasks, on the contrary, they were required to unbend the wire in order to push the bait out of the pipe. Several orangutans solved both of these tasks, and two monkeys handled them in a matter of minutes. However, the children were not so agile. Three-five-year-old children rarely coped with such tasks, and less than half of seven-year-old children were able to find solutions. And only eight-year-old children confidently bent and unbend a wire. However, do not despair. Children in all age groups found solutions after they were shown how to make and use the necessary tool. This indicates that the point here is not in the development of the intellect, but in the social-cognitive behavior.